Comments: The most common ibis encountered in the Great Plains, White-faced Ibises nest in large colonies, usually in dense, emergent, marsh vegetation. Ibises feed in large flocks in flooded fields and shallow wetlands, primarily on insects, crustaceans and earthworms. Pesticide and heavy metal contamination and drainage of wetlands led to an alarming drop in numbers in the 1960s and 1970s. Banning DDT and dieldrin, as well as habitat conservation and improvement projects, have led to an increase in ibis numbers. 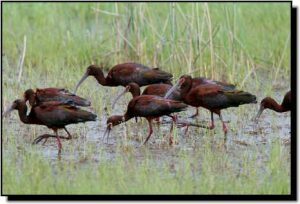 Conflicts with crayfish producers may arise when ibises flock to their ponds to feed. White-faced Ibises are most likely confused with Glossy Ibises.